The importance of women in Science, Technology, Engineering & Math has been gaining a momentum in the last years. At I T.A.K.E. Unconference, we value women’s contribution in IT and we believe their dedication to the software craft can be an inspiration for other practitioners. In the latest posts we invited you to learn more about the contribution women have in IT as Fransizka Sauerwein, Alexandra Marin and Grace Hopper. 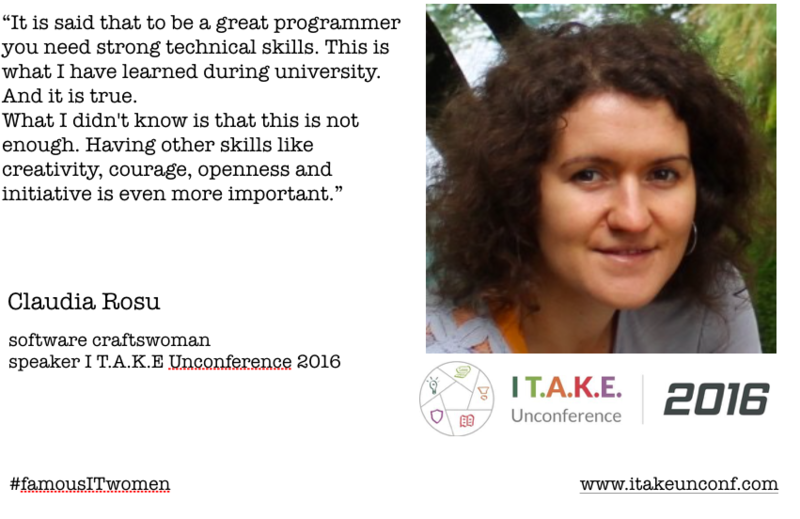 Now it’s time to introduce you Claudia Rosu, software craftswoman speaking @ I T.A.K.E Unconference 2016. Why did you choose to develop a career in this domain? First, I will say that I am proud to be a software developer. Since primary school I loved to solve math problems. Later, during high school, I was encouraged to follow Computer Science, as I had good logical and analytical thinking skills. Looking back, I would follow the same path, and I would change just a few things. What I would do differently is to rely more on my skills and spend more time reading. One story that changed my professional growth for the better: early in my career, my senior developer colleague told me that it is great to have a girl in the team as we pay more attention to details and we don’t leave bugs in the code :). On the reading side, I would include technical and non-technical books, which help us develop skills to: write quality code, communicate and collaborate better, focus on continuous improvement. With confidence in my skills and discipline in reading, I can now deliver quality software that helps the users in their activity. Extra, I am organizing and facilitating community events, speak at various gatherings to share my experience & learn others. It is said that to be a great programmer you need strong technical skills. This is what I have learned during university. And it is true. What I didn’t know is that this is not enough. Having other skills like creativity, courage, openness and initiative is even more important. Since realizing it, it is easier for me to improve as a professional, on both soft and technical skills. I admire most Rebecca Wirfs-Brock. I believe she can be a true inspiration for all women working or want to work in technology. I’ve met Rebecca 3 years ago at the first I.T.A.K.E. Unconference and since then I have learned a lot from her knowledge and experience. Improving the way I am doing software design is easier because of her insights on this topic. Want to meet Claudia? Join her & other amazing speakers at I T.A.K.E Unconference 2016!